St. John’s headlined the Legend’s Classic this week and took care of business, beating California 82-79 Monday night and outlasting VCU 87-86 in overtime last night. The Red Storm (5-0) were far from flawless in their two victories. It took them until the last seconds of regulation to finish off Cal - last place in the PAC 12 last season and picked to finish last again this season - and needed overtime and multiple clutch shots from Shamorie Ponds to get by a VCU squad picked to finish 5th in the Atlantic 10. The Johnnies are a talented, if small, offensive unit led by the junior Ponds and junior returnees Marvin Clark II and Justin Simon. Newcomers Mustapha Heron, LJ Figueroa and Mikey Dixon give St. John’s an offensively talented nucleus that should be able to play with anyone in the country. 6-foot-9 Center, Sedee Keita, the Red Storm’s lone true big on the roster, is out with a knee injury and is expected back in five weeks. 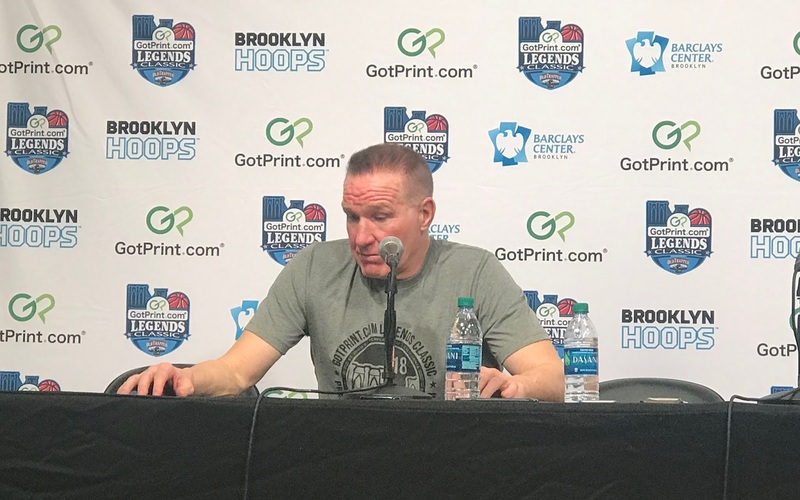 This week at Barclays Center in Brooklyn, St. John’s showed off their offensive talent and versatility, but also showed that they may not yet be ready for prime time. Defensively, they allowed unheralded Cal to shoot 57% from the field, including 44% from beyond the 3-point line. While Cal made some tough shots, St. John’s also exhibited “Swiss cheese defense” (shout out to Clyde Frazier), allowing way too many easy forays into the paint and uncontested layups. The following night, the defense was improved versus VCU, but mental lapses often allowed the Rams to stay in the game and take leads late in regulation and overtime. However, a win is a win is a win. And maybe those preseason prognostications were wrong and Cal and VCU will prove to be better than was thought. St. John's coach Chris Mullin addressing the media after the Red Storm's victory over VCU. Yes, it is easy to get caught up in the influx of talent and experience now on the Red Storm’s roster and expect them to easily win the games they are favored in. But, teams take time to build and there is no doubt progress is being made. As Mullin eluded to, it is highly likely that St. John’s would have lost one or both of those games last year. Ponds, who scored 32 and 35 points in the two wins respectively, made every big shot and big play the Johnnies needed. He looks even better than last year and is clearly one of the better guards in the country. Heron is a big time player and Figueroa is better than advertised. St. John’s is not there yet. They are not an NCAA Tournament team yet. They are not the best team in the Big East, yet. But, the pieces are there, the experience is there and most importantly, the belief is there.